This three piece bedroom furniture consists of a two door wardrobe, a three drawer chest and a one drawer bedside all finished in gloss with metal silver handles. 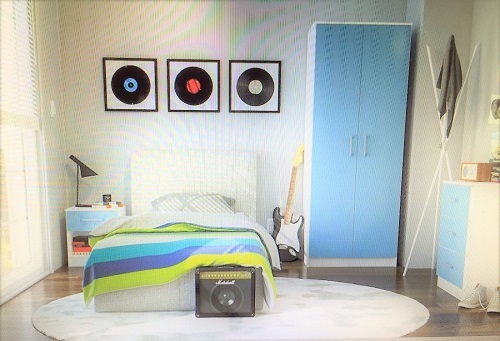 The bedroom furniture is in blue or pink with a white carcass. Dimensions: Two door wardrobe (2 boxes) – Length: 70cm/ 27.5 inches Height: 181cm/ 71 inches Depth: 50cm/ 20 inches One drawer bedside (1 box) – Width: 40cm/ 16 inches Depth: 35cm/ 14 inches Height: 46cm/ 18 inches Three drawer Chest (1 box) – Width: 60cm/ 24 inches Depth: 36cm/ 14 inches Height: 70cm/ 27.5 inches.